musical shelf and been passed over... until now. Tommy McCook, it sometimes felt, their services if nothing else were slightly underused. the original cut, laid back in the mix to the more Sound System friendly drum and bass cut. in Tappa’s mind can be noticed more. Maybe it’s a Jazzier / Bluesy feel shining through. So sit back and enjoy a lost release that time and place did not find time to see the light of day. As the opening track testifies and in the immortal words of Mr Tappa Zukie himself..
allowing in this mix the horn section to take it some place else. Working the timeless 'Take 5 ' rhythm in fine form. The 'Riding West ' rhythm gets a horn line that gives it a nice jazz feel. with Vin Gordons fine trumpet playing. life on this lost till now cut. 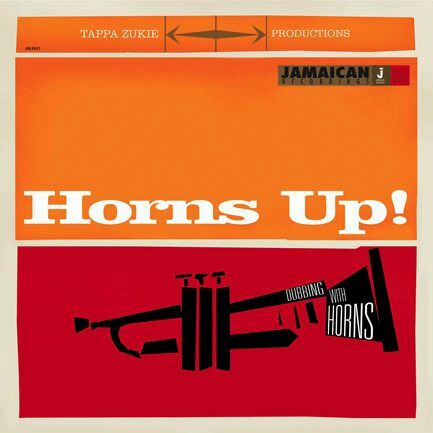 The Horn cut to Tappa's classic track with Horace Andy, 'Natty Dread a Weh She Want '. Another timeless rhythm made famous on Junior Ross and the Spear's 'Babylon Fall Down'. Mr Tommy McCook adding a little magic. it belongs to a spaghetti western film on this haunting cut. Prince Allah's 'Just One Way' provides the backbone to this instrumental horn cut. Tappa Zukie / Horace Andy's 'Raggamuffin' gets the Horns Up treatment.